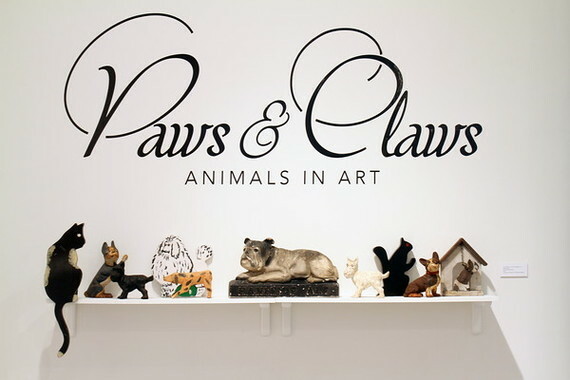 Paws & Claws at the Cultural Council of Palm Beach County is a twenty-first century take on the historically significant subject of pets and other seemingly benign animals in art, a bird’s-eye view of contemporary South Florida artists who have embraced this topic in sculptures, paintings, photographs or on paper. While some may snarl or howl at the subject of pets in art, and consider it kitschy, its backstory is most esteemed. Hockney’s Stanley and Boodgie, Warhol’s Archie and Amos, and Picasso’s Lump were all dachshunds who became lyrical and frequent portrait subjects for their masters. Alberto Giacometti’s attenuated bronze Cat (1951) was auctioned by Christie’s five years ago for $20.8 million, while his littermates can be viewed slinking through the collections of the Metropolitan Museum of Art and the Fondation Maeght in St. Paul de Vence. And their counterparts, Giacometti’s emaciated stealthful Saluki Dog quasi-silhouettes, dwell in such doghouses as the Museum of Modern Art, the Wexner Center for the Arts and the Hirshhorn Museum. Picasso’s legendary portrait of Dora Maar with Cat (1941) was auctioned by Sotheby’s for $95.2 in 2006, making it one of the most expensive artworks in history. Jeff Koons’ joyful Puppy (1992) has been planted in Rockefeller Center (2000), and Sydney’s Museum of Contemporary Art (1995), and today this flowering 43-foot West Highland terrier permanently stands guard at the Guggenheim Museum in Bilbao and on the lawn of the Brant Foundation in Greenwich, Connecticut. For centuries, artists have been fascinated by pets. Jan van Eyck’s 1434 Arnolfini Portrait (also known as The Arnolfini Wedding, now hanging in the National Gallery in London), one of the most revolutionary portraits in the annals of western art, depicts a wealthy couple, the woman wearing an ermine trimmed green silk cloak, her affenpinscher dog alert at her hem. Pairs of sacred Chinese Foo dogs first appeared as protective statues nearly two thousand years ago (although some say they were never meant to be dogs, but lions.) Both the Empress Josephine Bonaparte and Emma, Lady Hamilton, the mistress of Napoleon’s nemesis Lord Nelson, were famously depicted with their lapdogs.